Photos, photos, and more photos. Dear member, past member, and friends of the Otago Motorcycle Club. I would like to take this opportunity to invite you personally to our seventieth-anniversary celebrations. I hope this comes as no surprise, I have fingers crossed that the grapevine has already reached you via Facebook, our website, and the regular monthly newsletters. The anniversary committee has been very hard at work creating a weekend to remember, and we have put quite a bit of effort into finding out where everyone is currently residing so we can get as many old and new friends together to celebrate this achievement. I hope this invite makes it you in a timely fashion so you can get travel and accommodation sorted for the weekend. Don’t forget to register ASAP, tickets are limited, so act now to guarantee your spot in the continuing history of The Otago Motorcycle Club. I look forward to seeing you on the 22nd & 23rd April 2016. The Otago Motorcycle Club Inc. Grab the Registration form file below fill it in and post to us, it is that easy. 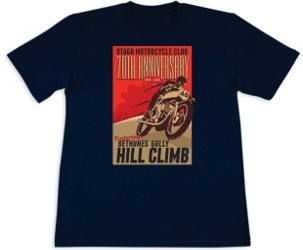 Registration desk will be in the Clubrooms from 6.00pm, bar prices will be super low and a light supper will be served, we will have a rolling slide show featuring 70 years of motorcycling OMCC style. Come down for your welcome pack, a few beers and a good old fashioned yarn. Come and ride the Historic Bethune's Gully Hill Climb, the OMCC have been running hill climbs up Norwood Street ( Bethune's Gully ) since the 1940 ’ s. It was ridden back in the day by none other than Burt Munro himself, although it is now tar sealed and is open to all types of bikes and riders, if you can ’ t ride there is plenty of opportunity for spectators so why not come down and join in the action. Door opens at 17:30 pm. Our evening starts at the Otago Golf Club ( 125 Balmacewen Road ) with a few drinks and Canapé's. Our first guest is past OMCC President and now President of Advanced Motorsports Ducati Dallas Jeff Nash. After dinner our second guest is Motocross legend Josh Coppins. After all that there will of course be time to do some catching up and reminiscing about 70 years of motorcycling.